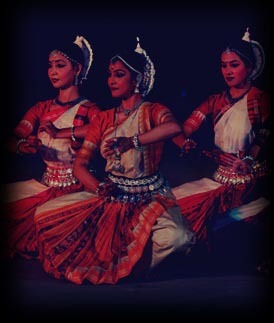 Odissi dance, one of the oldest classical dance forms of India finds expression IN stone in the form of sculptures. Some of these ancient sculptures found in caves and temples are Shilpaankan (translation into sculpture) of the movement language of Odissi. Later in 20th century Odissi dance was reborn and revived on basis of these sculptures. IF SCULPTURE IS FROZEN DANCE…… THEN DANCE IS PULSATING SCULPTURE NRITYANKAN (meaning translation into dance)is the production that weaves together the myths, legends created through sculptures in the Ellora Caves near Aurangabad city trans- created through dance. The scenes attempt to relive the period when the sculptures were created and also narrate the legends frozen in time in the form of sculptures. Scene 1 : BUDDHA (the buddhist caves emanate the spiritual energy accumulated through meditation, learning and austerity by the monks who lived here. The caves are done with minimalist approach which is delineated through dance accompanied by chants in Pali.